M-Brain is a hybrid company combining big data technology and human intelligence. M-Brain’s intelligence expertise is a combination of proprietary artificial intelligence development and human relevance screening. Our in-house machine learning engine analyses and classifies billions of online documents, constantly improving its capabilities through training data. Furthermore, our 400 analysts worldwide add intelligence and value to our clients by providing them with insight based on information from 70 languages. M-Brain’s in-house crawling technology and global source database of over three million sources is continuously developed according to real-time user statistics as well as M-Brain’s coverage strategy. 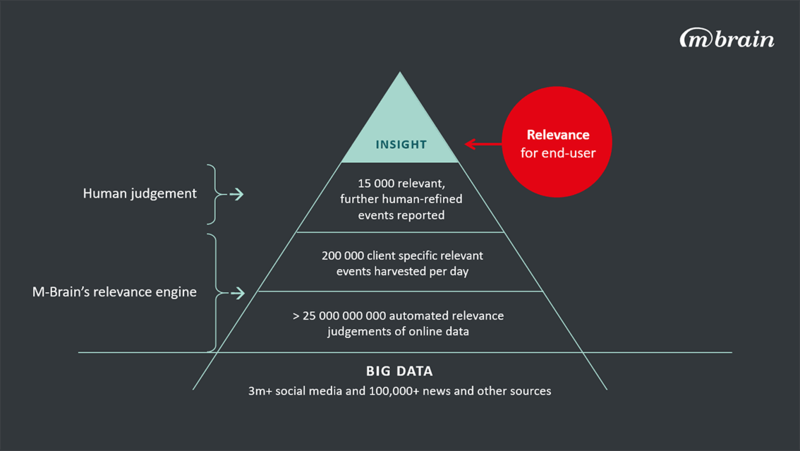 Our content refinement process is built on augmented intelligence, where usage metrics from our global customer base validate the relevance of our source portfolio. Our proprietary machine learning engine makes approximately 25 billion automated relevance classification judgements every day, distilling its findings to approximately 200,000 client-specific relevant events. To further ensure utmost content relevance, M-Brain employs an in-house Source Analysis Team that supports the automated refinement process on the source coverage side, maintaining our source database, adding client-specific sources by request and conducting research on new relevant sources. This hybrid model ensures that customers benefit from both usage pattern-based relevance adjustment as well as have the option to directly influence the sources M-Brain covers.